Yunnan snub-nosed monkey Snub-nosed monkeys (also known as snub-nosed langurs) are able to survive in cold temperatures better than any other primate. They live in areas that are covered in snow as much as half of the year; endure winters with sub zero temperatures; and live at elevations up to 4,500 meters, although during the winter they usually descend to lower elevations. Snub-nosed monkeys have a head and body length between 51 and 67 centimeters and a tail length of 51 to 97 centimeters. They spend most of their time in trees but come to ground for some feeding and social activities. If threatened they can race through the upper levels of the canopy at great speeds. Snub-nosed monkeys are among the most endangered primate species in Asia. They have been hunted for centuries for their pelts and body parts, for Chinese medicine. The Manchu valued their pelage which was believed to ward off rheumatism. There are only a few hundred or a few thousand left of each species. Yunnan snub-nosed monkey Snub-nosed monkeys primarily eat leaves, grass, lichens, bamboo shoots, buds and fruit. They cover between 1,000 meters and 1,500 meters a day when they forage. Group of 100 and even 600 have been observed but a typical group has a single male, three to five females and their young. Dominant males sometimes fight with rivals who want to claim their females. Males usually reach sexual maturity when they are seven; females when they are four or five. Birth usually take place in the spring or summer after a 200 day gestation period. Usually one, sometimes two, young are born. Groups claim a temporary territory of four to 50 square kilometers and change every month. If two different groups meet they usually avoid a conflict and head in different directions. The most frequent vocalization, “ga-ga,” is shrieked out loudly when a food source is found. Guizhou snub nose monkey There are three main mountain species of snub-nosed monkey: the black snub-nosed monkey; the Yunnan snub-nose monkey; and the Sichuan golden snub-nose monkey. 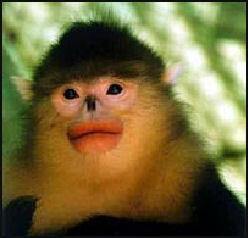 There is another species that lives in the lowlands; the Guizhou snub-nose monkey. 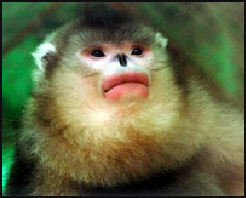 The pig-tailed snub-nose monkey, Guizhou snub-nose monkey, and black snub-nose monkey are endangered. The Yunnan snub-nose monkey has predominately black shoulders. It lives in temperate mountain forests from 3,000 to 4,000 meters, an environment with snow and below freezing temperatures for several months a year. Black snub-nosed monkeys lives in the highest elevations of any non-human primate: in high mountain forest up to 4,500 meters on a single mountain in the Nujang Lancang Gorge region of Guizhou in China. Males average 15 to 17 kilograms, females average 9 to 12 kilograms. They have a head body length of 74 to 83 centimeters and a tail length of 51 to 72 centimeters. Black snub-nosed monkeys spend a lot of time in high evergreen trees. They feed on lichens, leaves, grass and fruit. Their pelt was once valued as a remedy for rheumatism. Today they have suffered from loss of habitat as a reuslt of logging. There are believed to be only between 800 and 1,200 left. Golden snub-nosed monkeys live in the high, cold forests of Sichuan, Gansu, Hubei and Shanxi Province, their habitat often overlapping with that of giant pandas. Deep snow and bitterly cold temperatures are common throughout their habitat in the winter. To stay warm the monkeys huddle together on the branches of trees. Why the odd face? No one is sure, but Penn State primatologist Nina Jablonski suggests the flat muzzle evolved to combat extreme cold, "which would cause frostbite to bare, exposed, fleshy noses." Golden snub-nosed monkey live in territorial bands that can top 400 animals. Large social networks help fend off predators, like clouded leopards. Mothers outrank barren females and males with multiple mates gain high status. So do males that display "courage and perseverance," biologist Qi Xiao-Guang of Northwest University in Xian, China told National Geographic. Bands may clash when ranges overlap, and "males show their vigor by fighting and forcing the enemy out." Territorial animals, including these and other primates, often do more posturing than injuring---mainly to protect themselves. The fur for these monkeys was once so highly valued that only the highest officials were allowed to wear it. They have been protected since 1957 but their numbers are falling as a result of loss of habitat. Holland wrote, “Golden snub-nosed monkey are being squeezed by logging, human settlement, and hunters wanting meat, bones (said to have medicinal properties), and luxurious fur. Many have been pushed into high-altitude isolation, where they leap across branches, traverse icy rivers, and weather long winters at nearly 10,000 feet, shielded by that coveted coat. They have made great adaptations to survive, subsisting on low-protein lichens and bark when trees are bare. Golden monkey In 1995, 40 square miles of virgin rainforest, where golden monkeys live, in Deqin county in Yunnan was sold to logging companies whose environmental impact studies failed to even mention the monkeys. 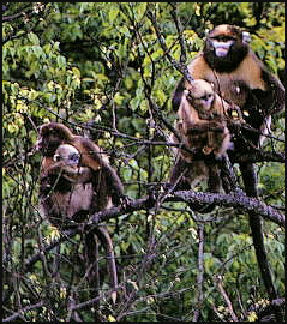 Of the 1,000 Yunnan golden monkeys that remain in the wild about 200 of them live in the Dequin forest. The main timber company involved in deal only sold enough timber to pay about half of its operating costs with the government subsidizing the rest. A forestry worker from Yunnan named Xi Zhinong almost single-handedly saved the monkey by drawing public attention to its plight. 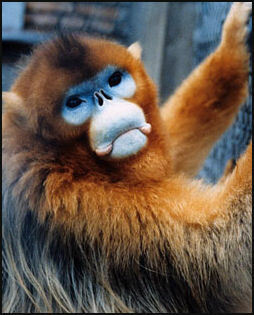 He launched an effort to save the Yunnan snub-nosed monkey after witnessing the animal’s habitat destroyed by logging. After failing to win any support from Yunnan officials, who he said at one point "even hinted that they could make me disappear," Xi went to Beijing where he organized students into candle-light "Save the Monkey" demonstrations under banners that read "LIVE AND LET LIVE" and "FORESTS FOR THE FUTURE." Petitions were sent to national leaders asking for help, the media picked up the story and college students camped in the monkey’s forest to draw publicity to the monkey’s plight. 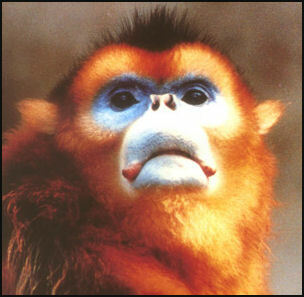 Photos by Xi of snub-nosed monkeys were widely circulated. They captured people’s hearts and helped win support for he effort to save the forest. The logging plans were eventually halted and the habitat was saved. Xi lost his job in the forestry department but his photos helped launch a new career as a photographer and he is now China’s most sought-after wildlife photographer. China's first and, for a time, only recognized environmental group, Friends of Nature, grew out of the effort to save the golden monkey. The forest home of the monkeys became a wildlife refuge.